Use vs. 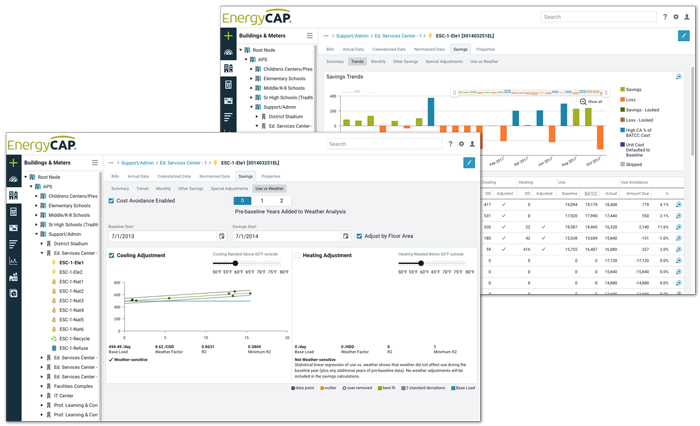 Weather graphs in EnergyCAP reveal correlations between the two variables. By comparing monthly degree days with meter energy usage, it is possible to derive a meter profile that expresses the weather sensitivity of that meter. How does EnergyCAP know when a meter is weather-sensitive? A linear regression analysis is used to model the effect of degree days on energy use reported on each bill. On Use vs. Weather charts, the vertical axis is the average daily use, and the horizontal axis is the average number of heating or cooling degree days per day. If the regression line rises from left to right, it means that months with more degree days have more use, suggesting that at least a portion of the energy usage is weather sensitive.